Where do the poems for the posters come from? The poster project reaches out to the poetry community over the summer, inviting poets to submit haiku poetry. This annual solicitation continues a tradition established by The Syracuse New Times Syr-Haikus contest. The weekly newspaper offered this contest to readers each spring, from 1997 to 2006. 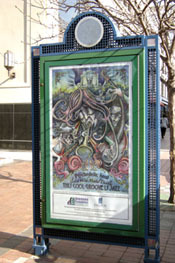 Tapping the contest’s interest, the poster project developed its own poetry solicitation in 2001. We mail invitations to members of the poetry community in June. The deadline for submissions is early September. Approximately 30 poets participate each year, each of them submitting up to five haiku. What are the poets asked to do? The project invites poets to write haiku poetry about the city, preferably focusing on the downtown. It also accepts haiku about the larger area, as long as the poems are about places or experiences that Syracusans can feel a home-town affinity for. Haiku originated with the poets of Japan, who’ve practiced it for hundreds of years. The three-line poems emerged from a kind of chain poem popular in the 16th Century. Haiku’s precursor was the form known as waka, consisting of five lines of 5,7,5, 7, 7 syllables. As waka became popular, poets enjoyed collaborating on linked waka. The linked form was known as renga. One poet would write the three opening lines; another would add the two following lines; yet another would add three new lines, and so on. Eventually, individual fragments of renga took on their own appeal. The form that became haiku, created from an opening fragment of waka, made a virtue of the poem’s seeming incompleteness. Readers could complete the poem in their own mind. How are the haiku and posters selected? The first round of selection takes place in the hands of the illustration students who create the posters. Each fall, the project has a body of approximately 200 poems, including new submissions (approximately 60 new poems each year) and poems remaining from past years. We give the poems to Professor Roger DeMuth at Syracuse University. Each student in DeMuth’s Advanced Illustration class receives a handful of these poems, on slips of paper, and chooses one to illustrate. Advanced Illustration is a year-long class with an enrollment of 20 to 40 students. In November, an informal committee reviews the resulting work, and selects the 16 posters that best combine image and poem. The committee consists of DeMuth; Jim Emmons, project coordinator; and Laurie Reed, marketing director for the Downtown Committee of Syracuse. In years when DeMuth’s class has small enrollment, the project supplements student work with work by professional artists - either SU faculty or alumni. The professionals illustrate a poem, or provide a Syracuse-related illustration to serve as inspiration for a poem. The project accepts the professionals' work without further selection. 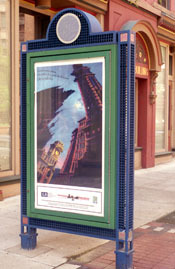 Where are the poster kiosks and what are they used for? 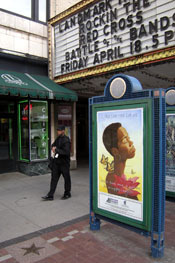 The city has approximately 25 two-sided kiosks on Salina and Warren streets. 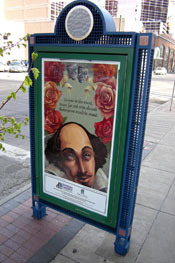 In addition to poetry posters, the kiosks display historic landmark posters, calendars of events and posters about cultural events. The project covers annual printing and production costs through a combination of corporate sponsorship, charitable grants, and revenue from sale of poster prints. How do the artists get involved? Professor Roger DeMuth, who teaches Advanced Illustration for Syracuse University’s College of Visual and Performing Arts, makes the project a fall assignment. Each of his students creates a poster based on a haiku of the student’s choice. What do artists and poets get for creating a poster? The students and poets whose work becomes a poster each receive three 11x17-inch prints of the poster. In addition, once a poster recovers its enlargement and printing cost through the sale of prints, the artist receives a 10-percent royalty on further sales, for the first year of sales. How long do the posters remain on display? The annual poster series comes out in April and remains on display for a full year.